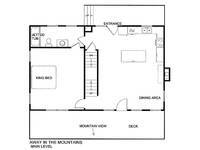 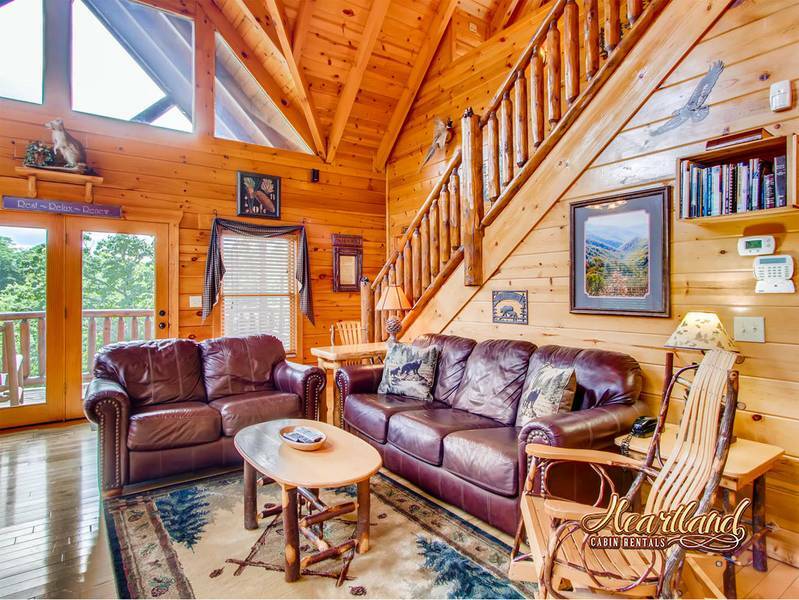 Away in the Mountains, a 3-floor cabin in a gated community has so much going for it, we don’t know where to start. 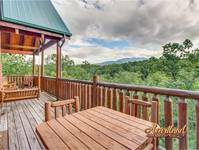 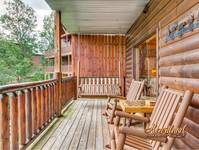 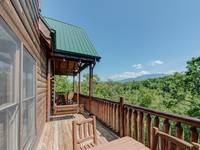 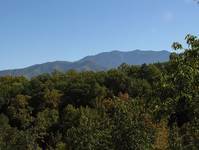 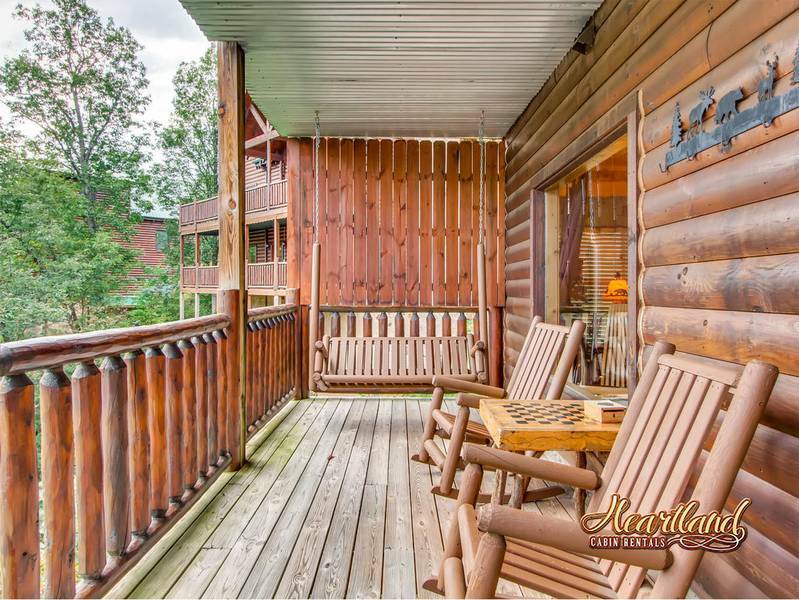 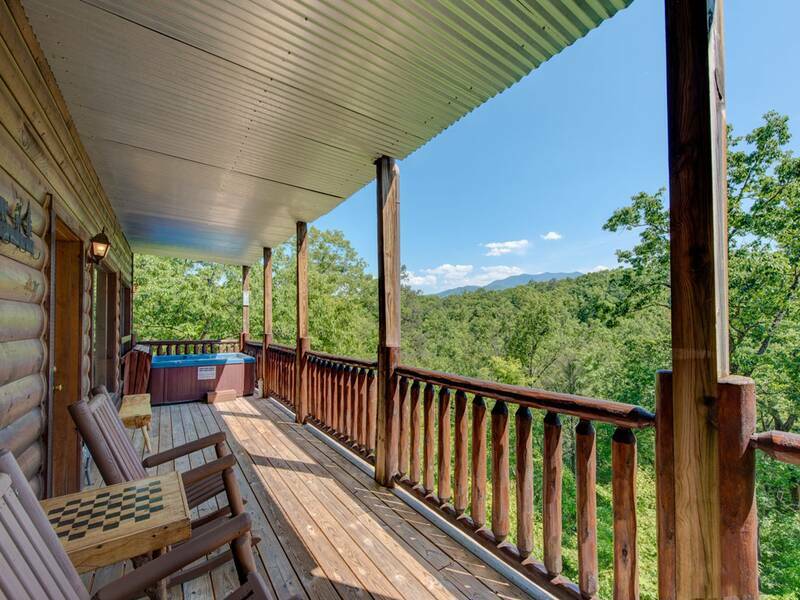 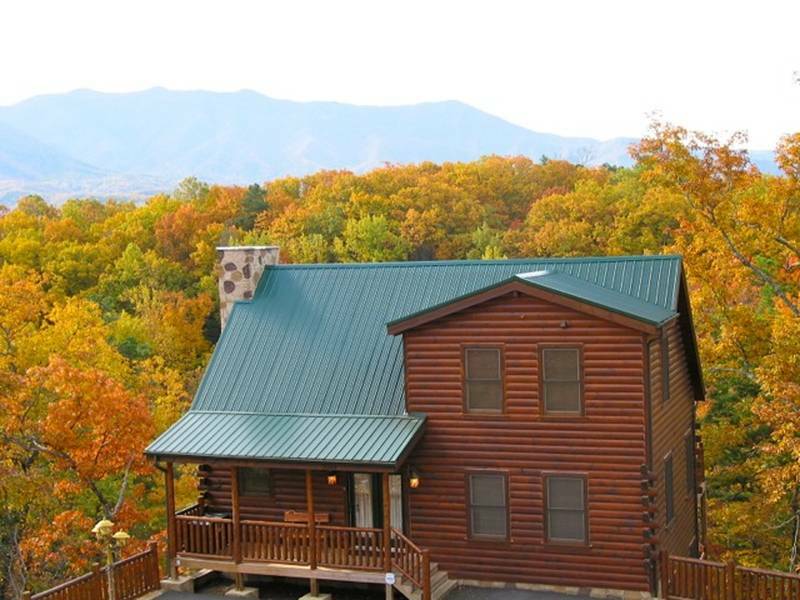 Not only is it in a stunning setting with views of the Great Smoky Mountains from its large decks, but it’s also just minutes from restaurants, parks, attractions, and activities ranging from skiing to white-water rafting. Plus the cabin itself is packed with luxuries, including an outdoor hot tub and a jetted tub in each of its 3 bathrooms. 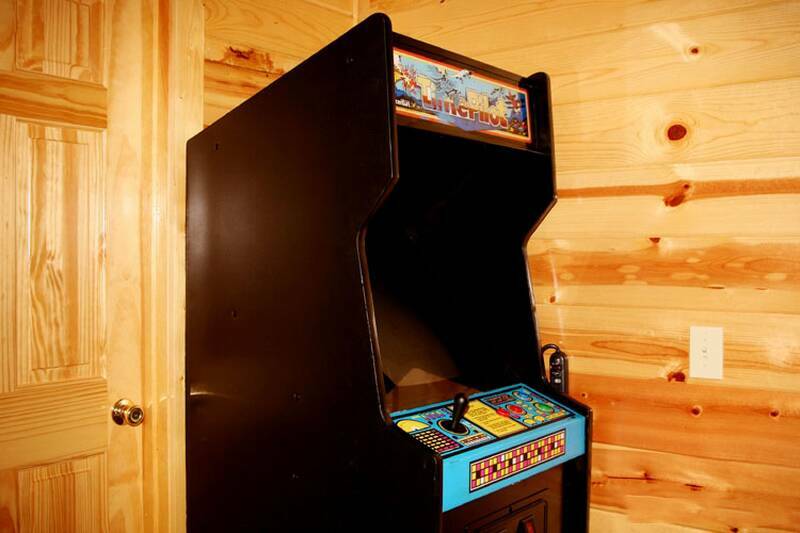 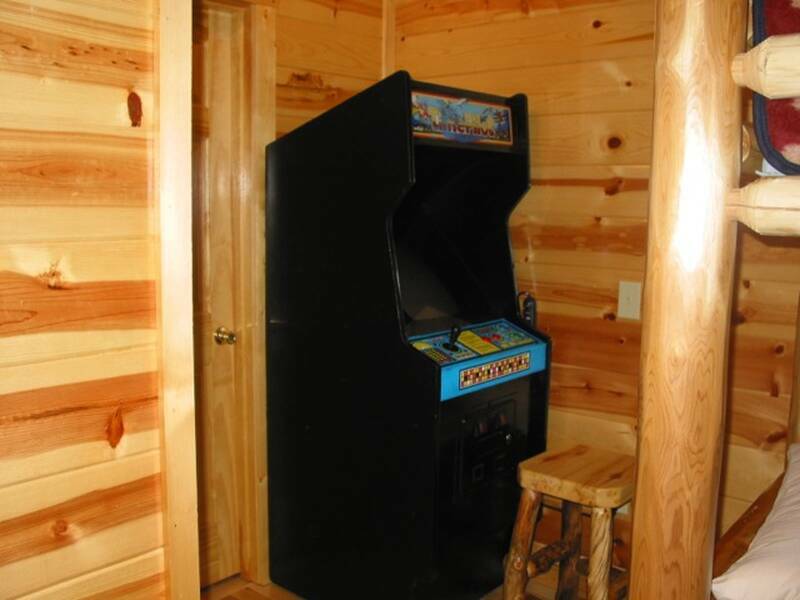 And just wait until you see the game room! 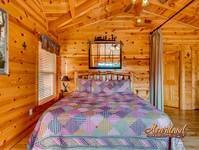 The cabin can sleep up to 10 people. 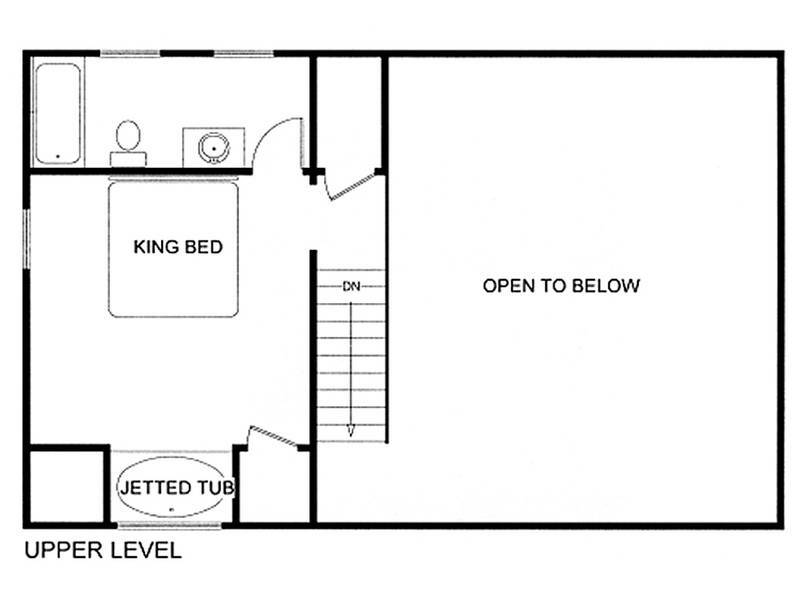 Each floor has its own en-suite bedroom, complete with a king-size bed, a TV, and a bathroom. 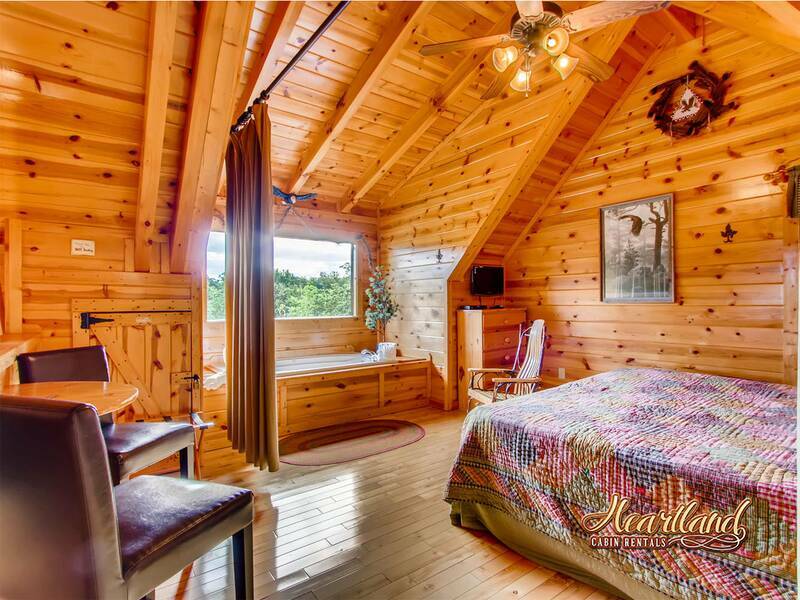 A master suite is, in fact, the only room on the loft level, so if it’s maximum privacy you want—plus a jetted tub right in the bedroom rather than in the bathroom—this is the suite for you. 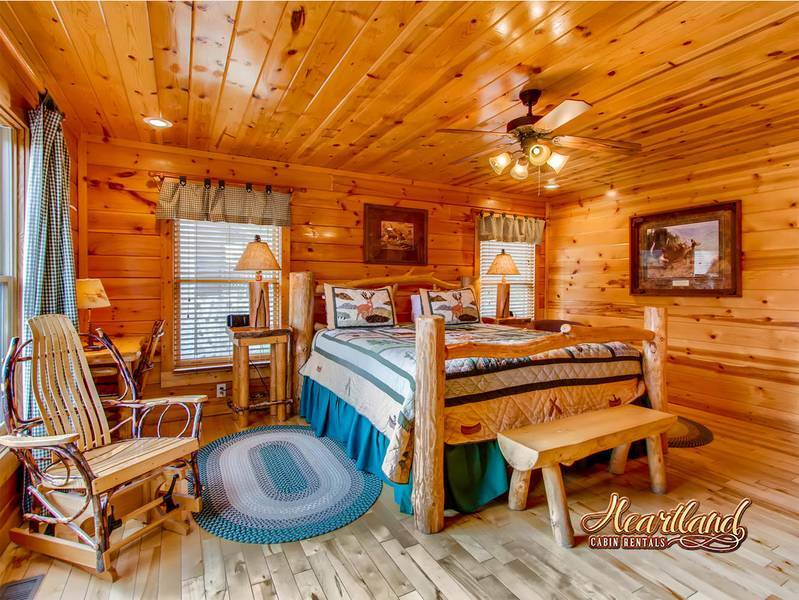 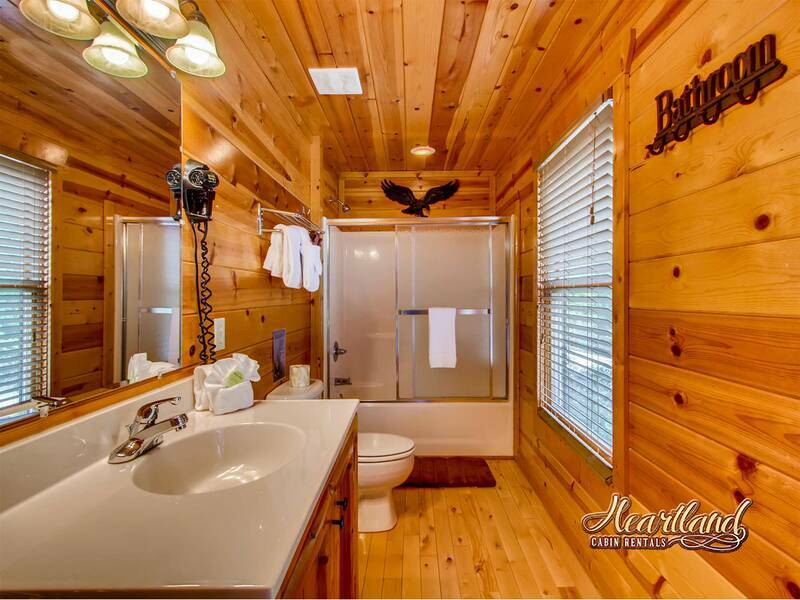 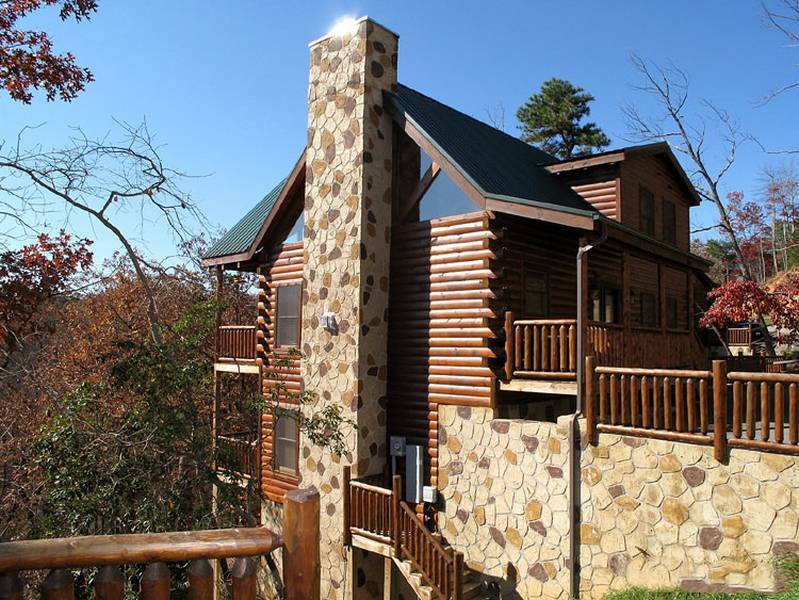 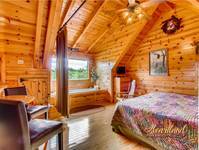 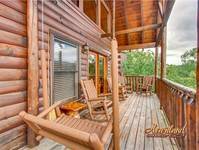 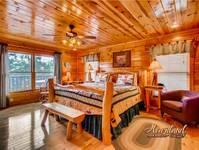 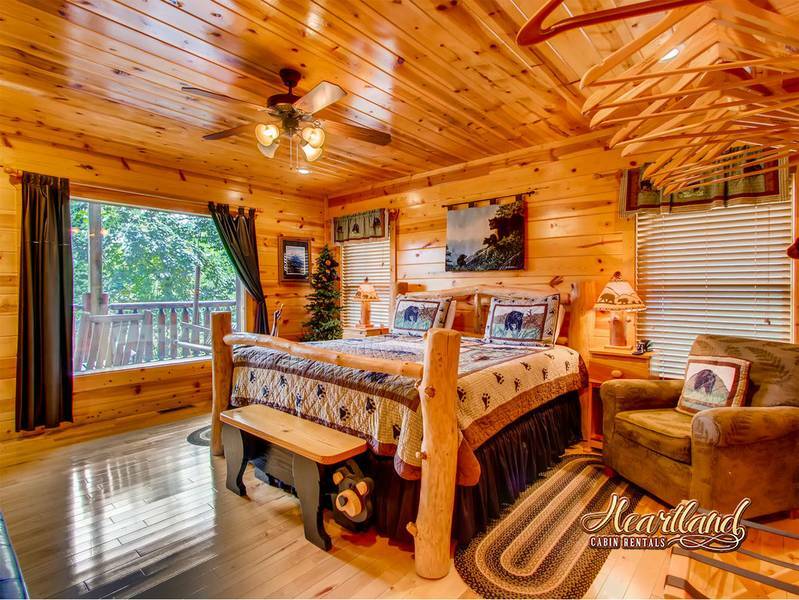 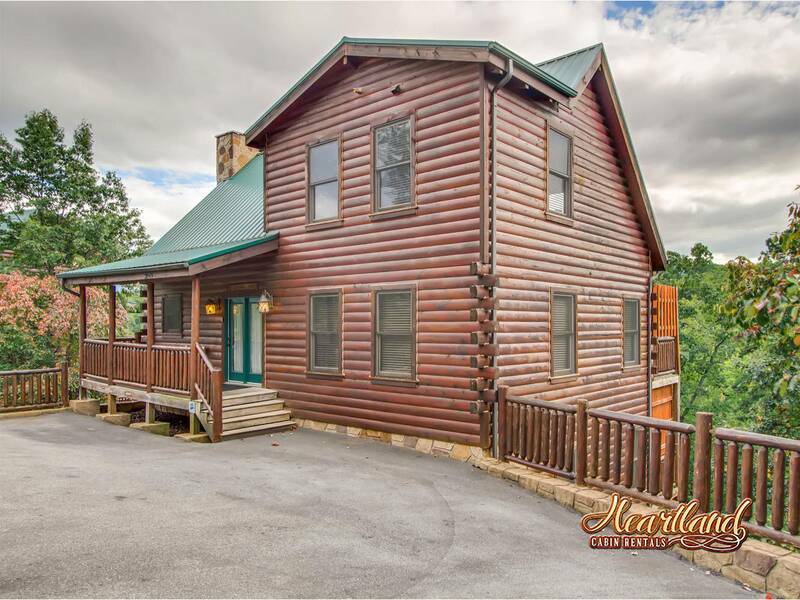 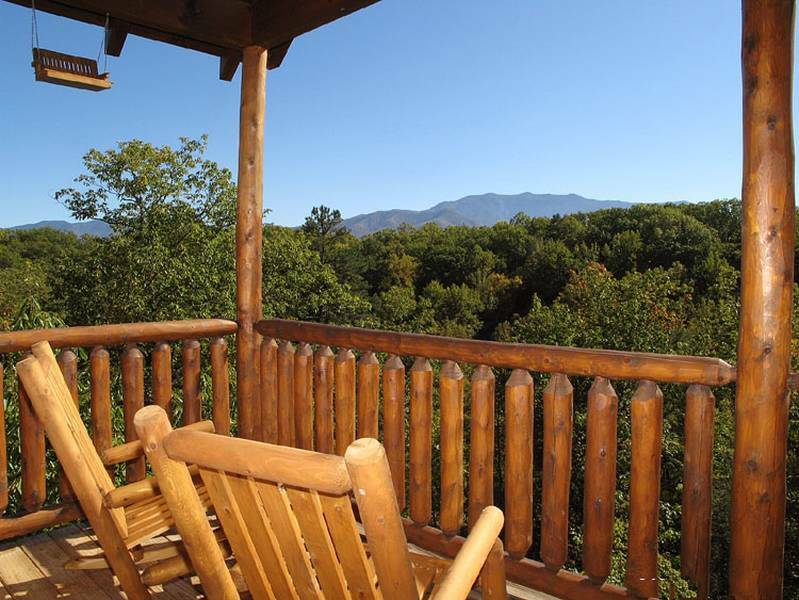 All 3 bedrooms are wonderfully restful, with their wood-planked floors, walls, and ceilings, log style furnishings, and views of the dense woodlands and the mountains beyond. 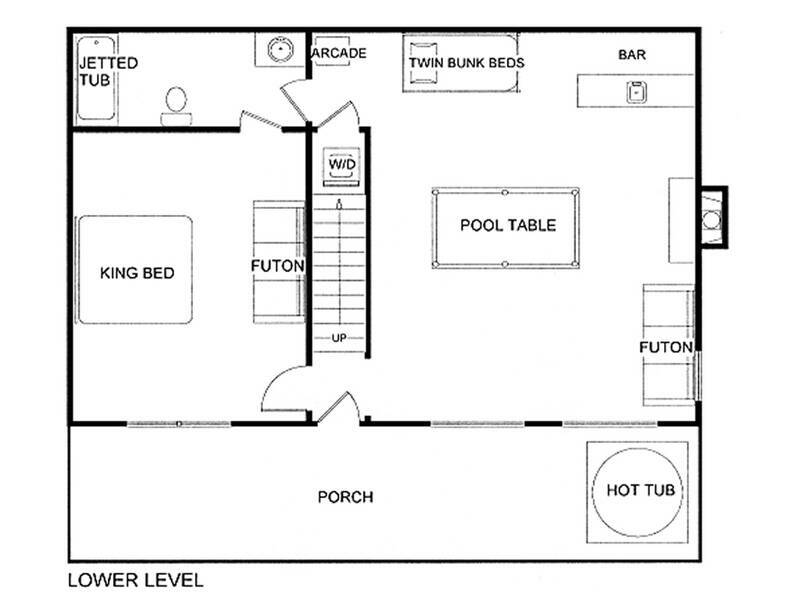 The game room on the lower level can sleep another 4 people, in bunk beds and a futon. 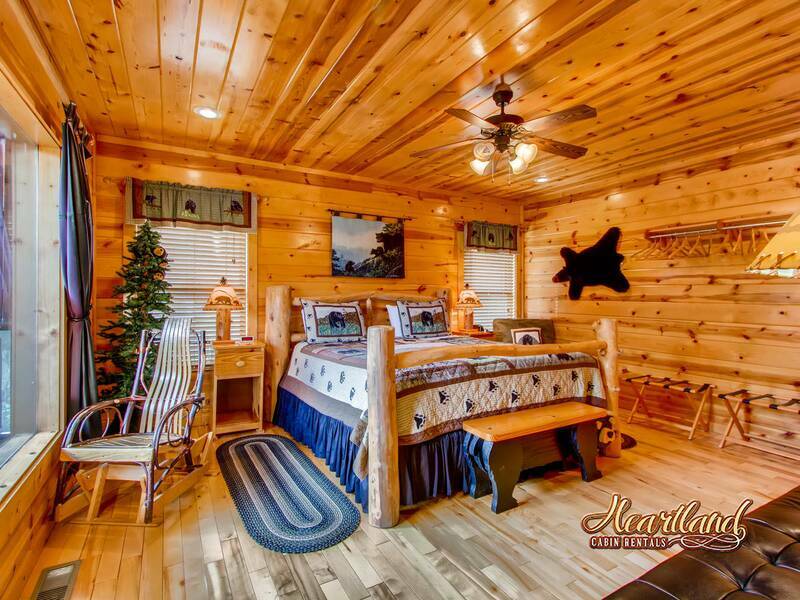 If you’re traveling with kids, they’ll probably beg you to let them have this as their bedroom! This roomy space also includes a full-size pool table, a multi-game arcade, a wet bar, and a 42” HDTV with cable and surround sound. 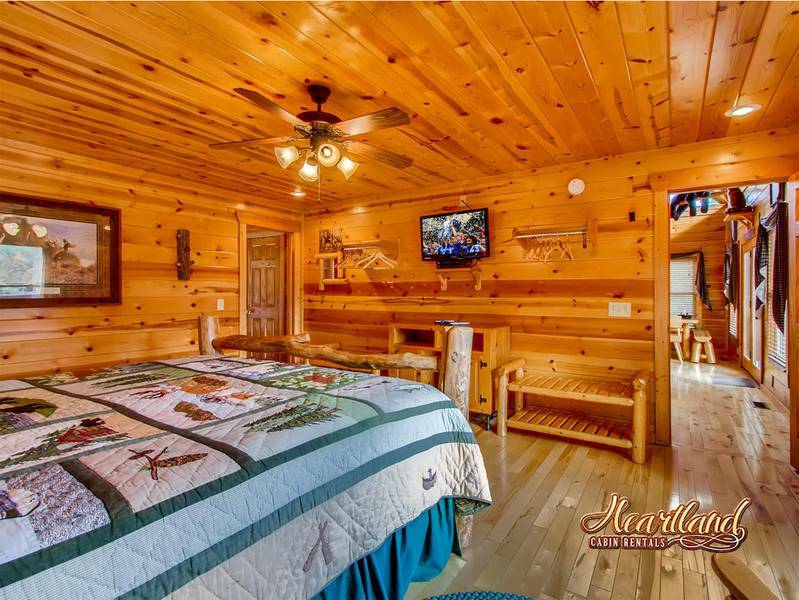 There’s even a gas fireplace to keep you toasty in winter. 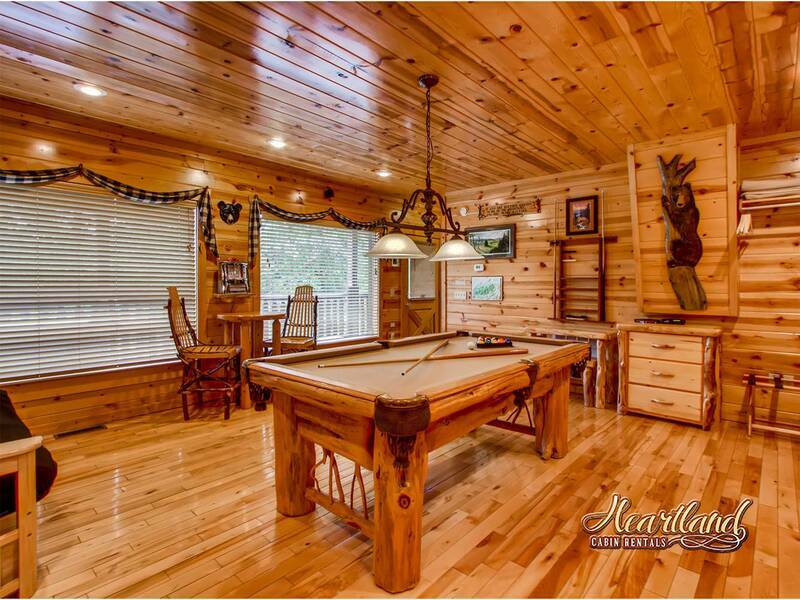 If you want to celebrate after winning your pool game—or need to console yourself after losing—step right out from the game room onto the lower deck and ease into the hot tub. 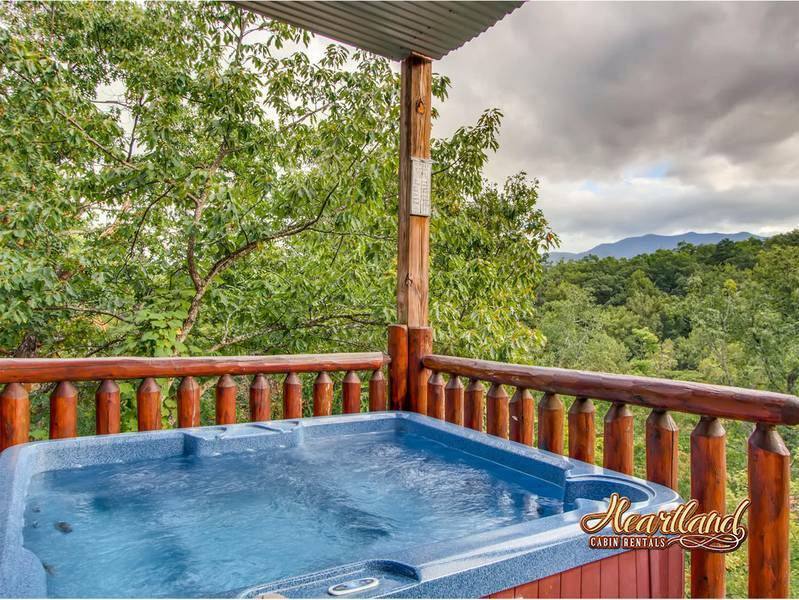 As you soak among steamy jets of water you can watch eagles and falcons soar above the mountains while the breeze rustles through the trees. 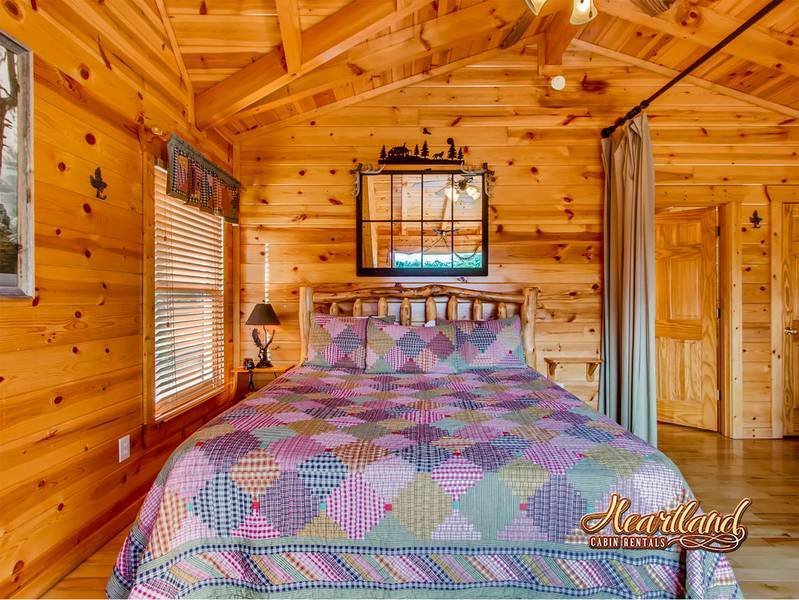 It’s a true feast for the senses! 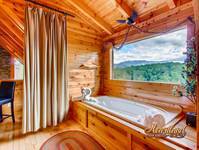 Of course, you can also savor the sights and sounds without soaking in the tub. 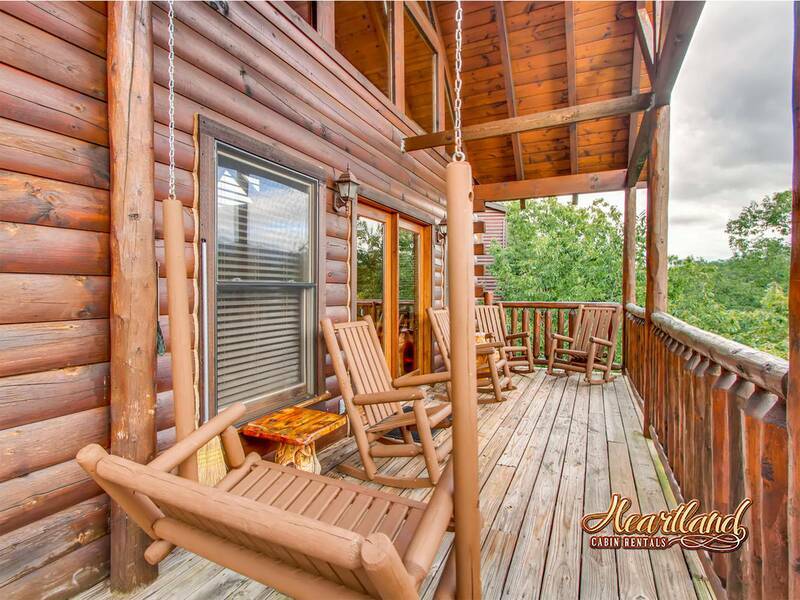 Kick back on one of the deck rockers first thing in the morning to listen to songbirds greet the day; enjoy an alfresco meal on the deck’s log-style table; nurse a nightcap with that special someone on the porch swing in the silvery glow of the moonlight. 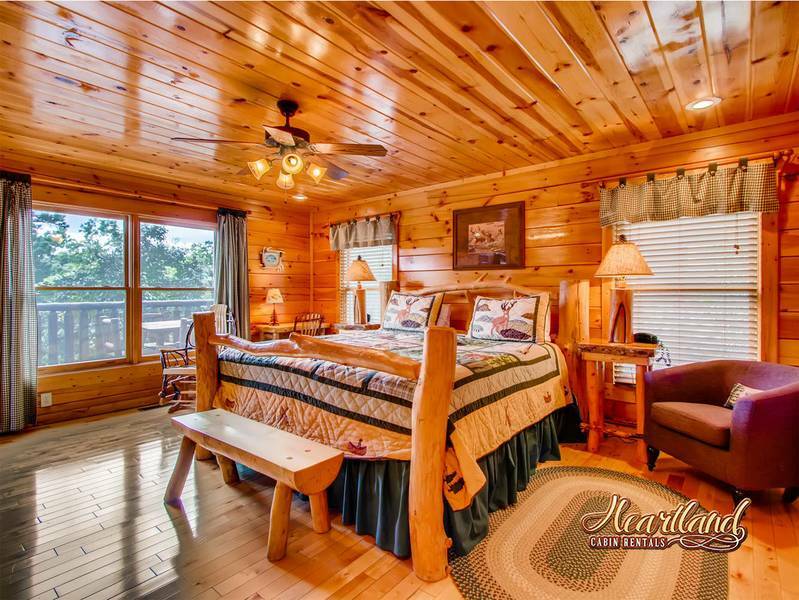 These are the magical moments you’ll remember long after you’ve returned home. 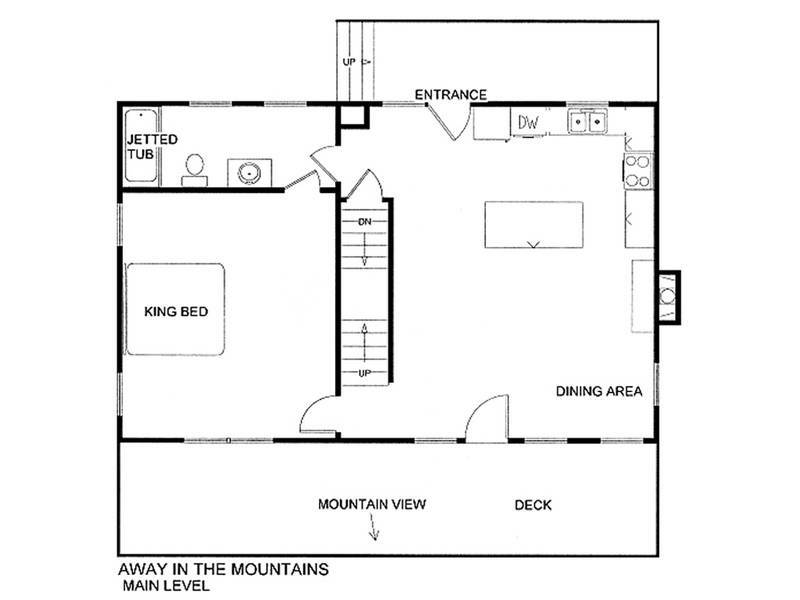 The main floor is home to the great room. 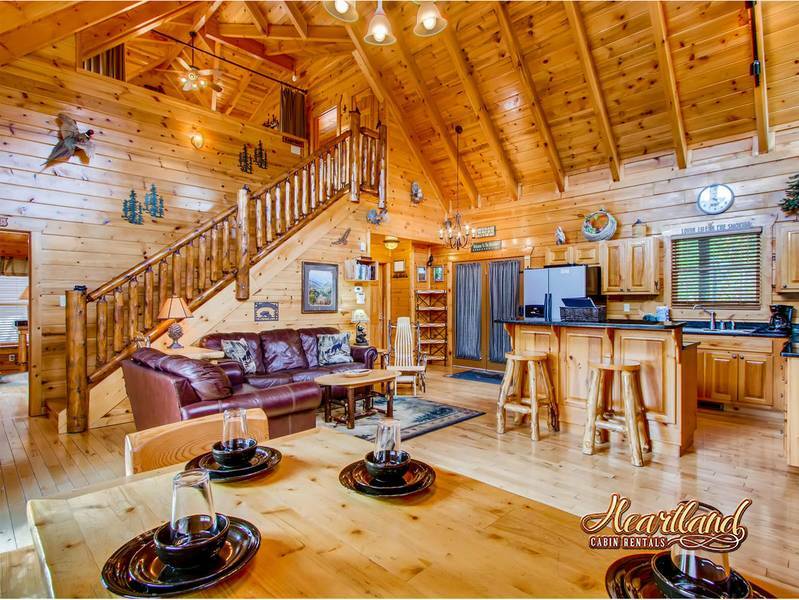 The double-height vaulted ceiling and expansive windows complement the rustic yet refined furnishings and add to the airy, open feel. 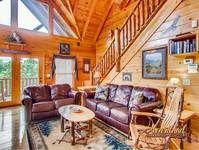 The whole gang can hang out together even while everyone does his or her own thing: nestle on a sofa and watch a movie on the 50” HDTV with cable, DVD player. 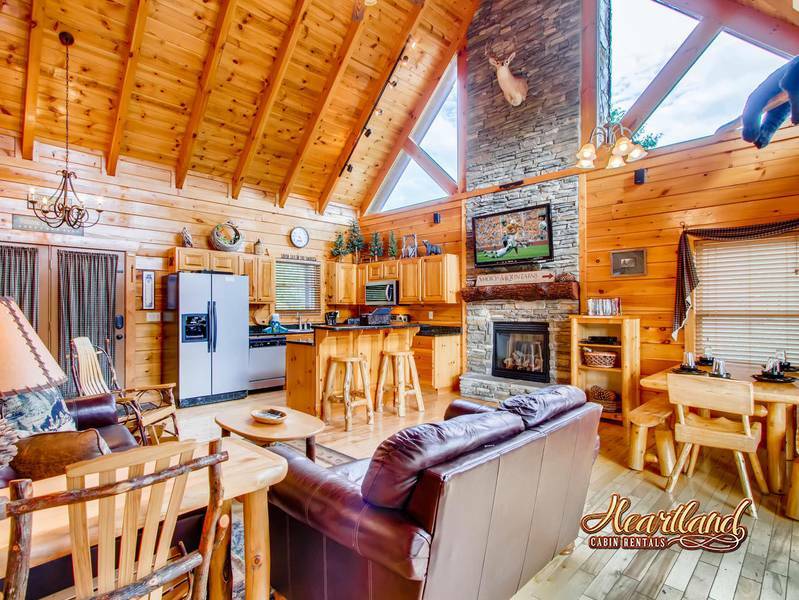 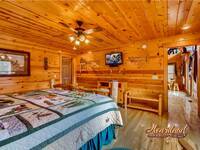 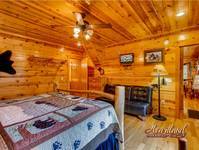 Stretch out and surf the web via the free WiFi; play Monopoly at the large dining table; enjoy a snack by the glow of the cabin’s 2nd gas fireplace. 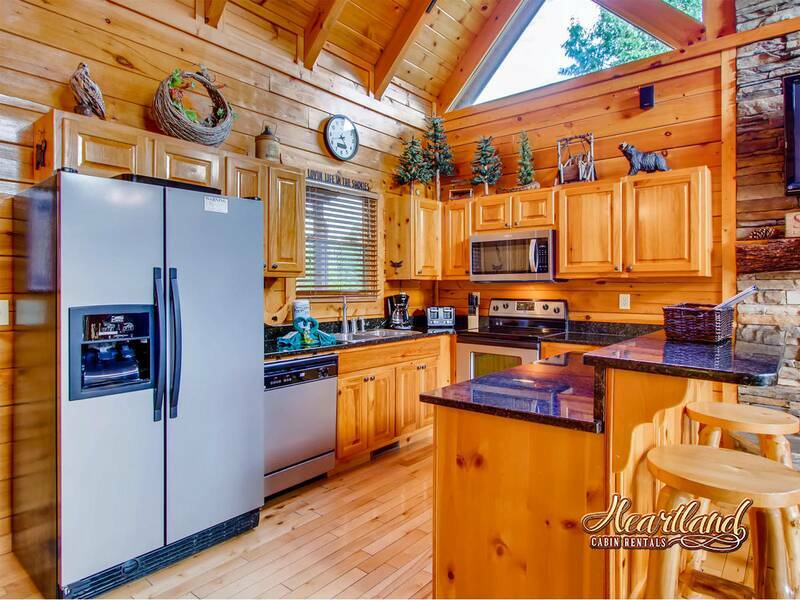 Whether you plan to create culinary masterpieces or simply brew coffee in the morning, you’ll appreciate the sparkling kitchen. Stainless-steel appliances, gadgets, cookware, tableware, and plenty of counter space and elbow room: The kitchen has it all. 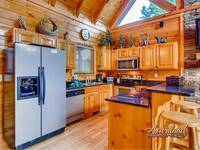 There’s even a breakfast nook where family and friends can help with slicing and stir… or at least keep you company while you channel your inner chef. 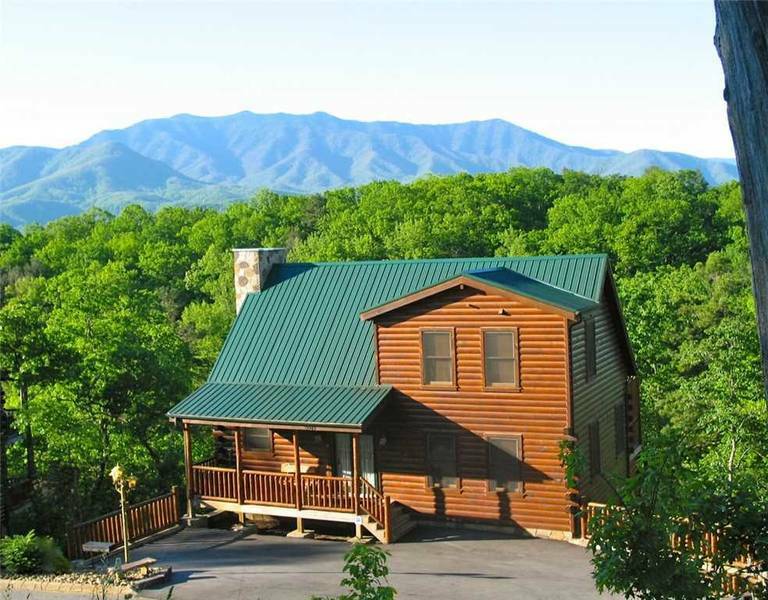 If you’re better at making reservations than making dinner, you’ll be delighted that Away in the Mountains is only 15 minutes from the many restaurants of downtown Gatlinburg. Also nearby is the Great Smoky Mountains National Park, which you can explore by foot, by bike, on horseback, or by car. 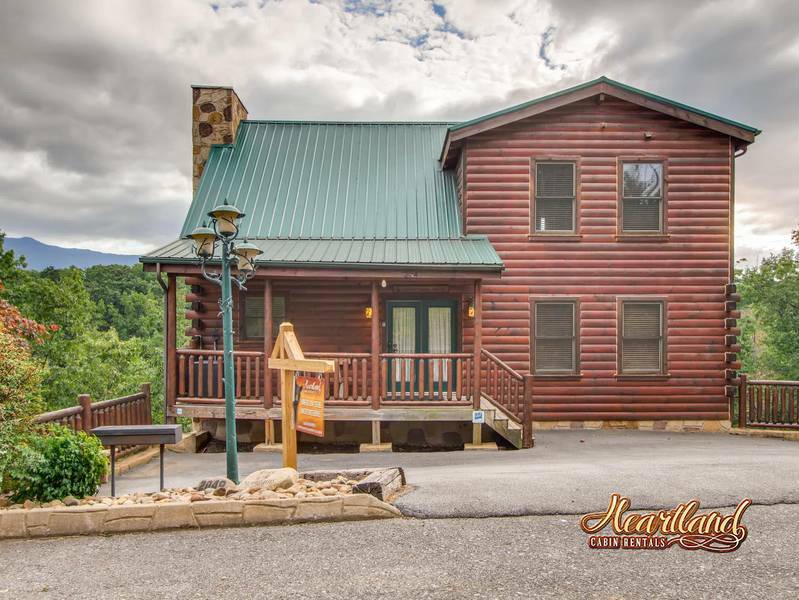 Because the cabin is located in Gatlinburg’s Arts and Crafts community, you’ll be among the Arts and Crafts Loop, an 8-mile trail of galleries, studios, and shops. 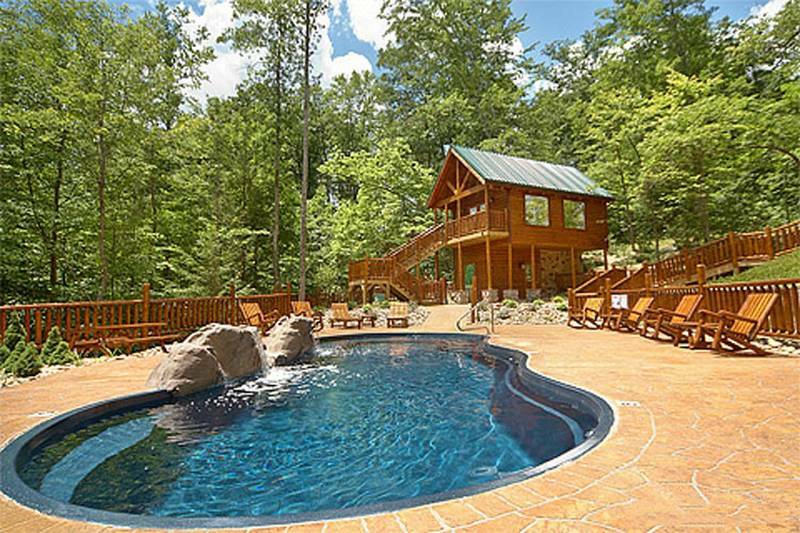 And if you visit in summer, you’ll have free use of the Settler’s Ridge pool and patio. 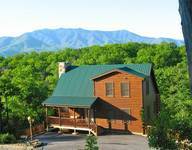 Away in the Mountains offers something for just about everyone. 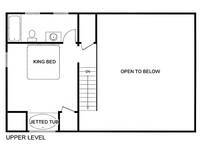 That’s why you should book your stay today; you don’t want everyone else to beat you to it! 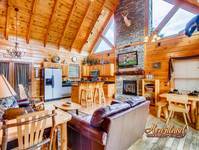 Cabin is NO SMOKING and NO PETS! 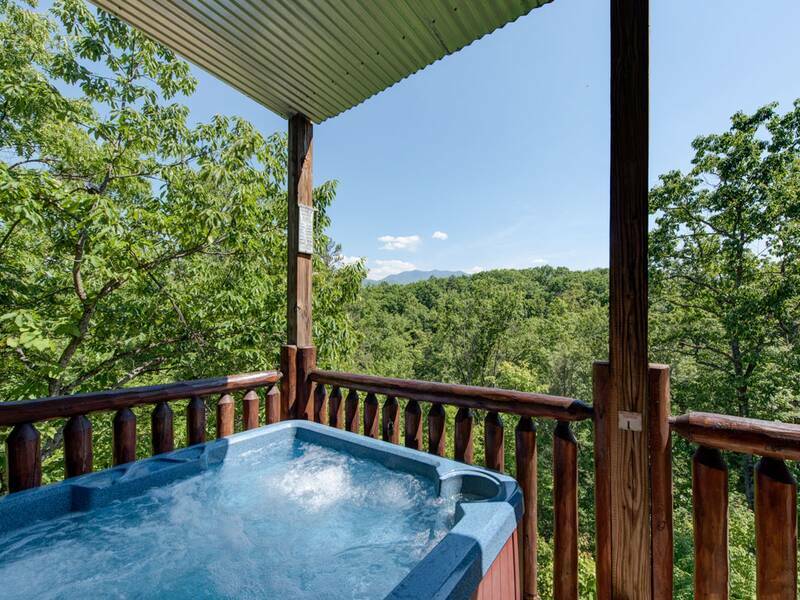 Our visit would have been perfect with the exception of the hot tub not working out first night. 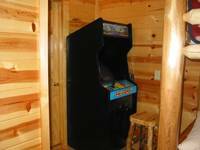 The staff sent out someone to fix it the next day and we were able to use it our second night. 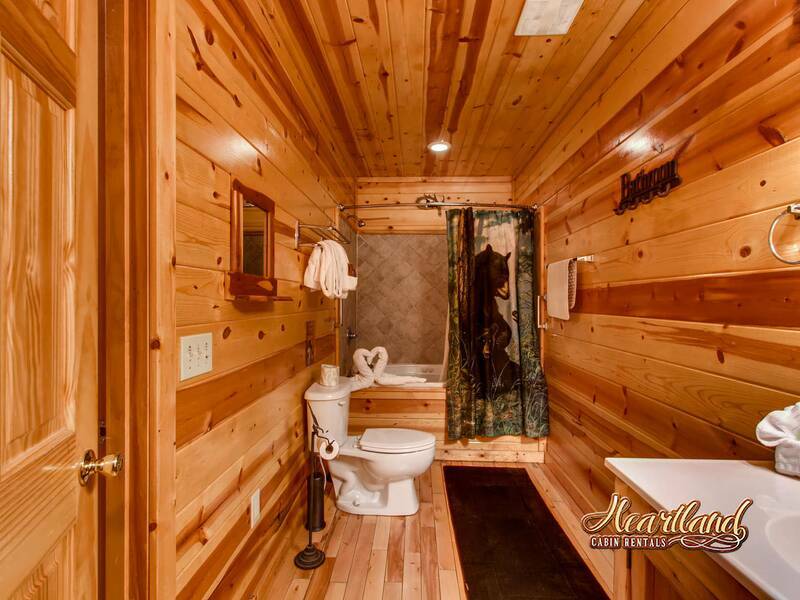 We were very happy with the cabin. 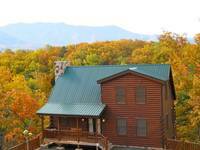 Away in the Mountains is three levels of splendor! 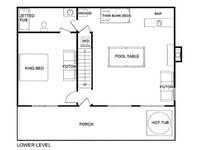 Every level is truly accommodating in not only necessary amenities, but with rustic ambiance and lounge-able space. 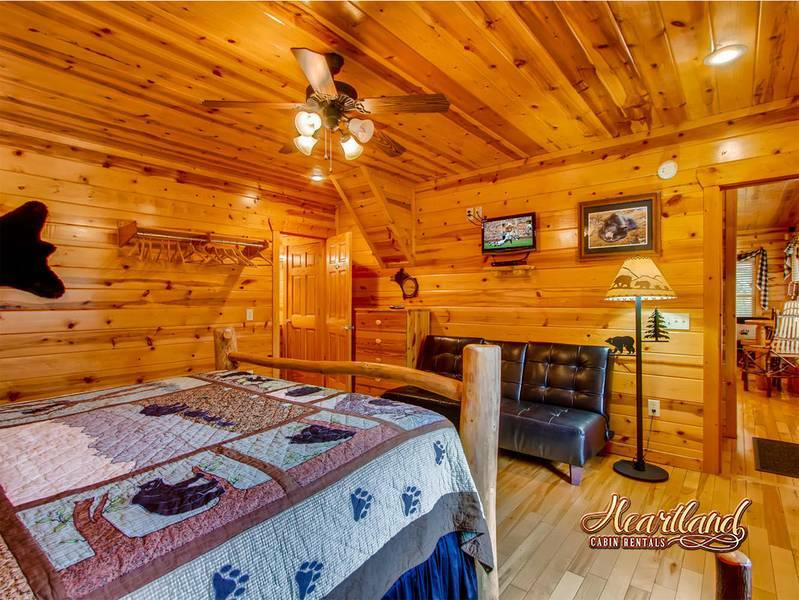 To think for the same price as a hotel room you can have ALL OF THIS! 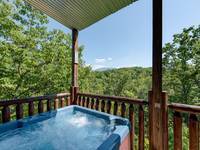 The views are expansive and there is privacy everywhere you go. 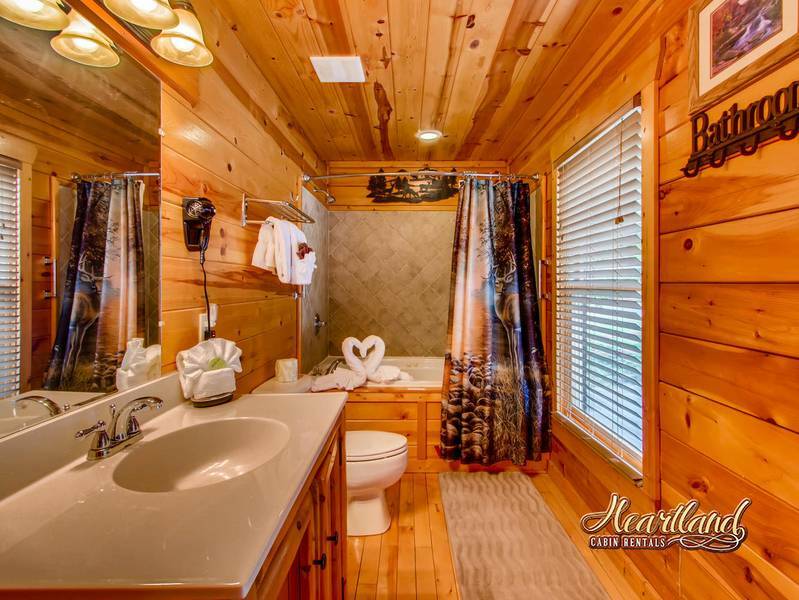 Each level of the cabin has its own personality and solitude and that makes it easy to not feel like everyone is “in your bubble” when you need some personal time to take in the view or read a few pages of a good book. 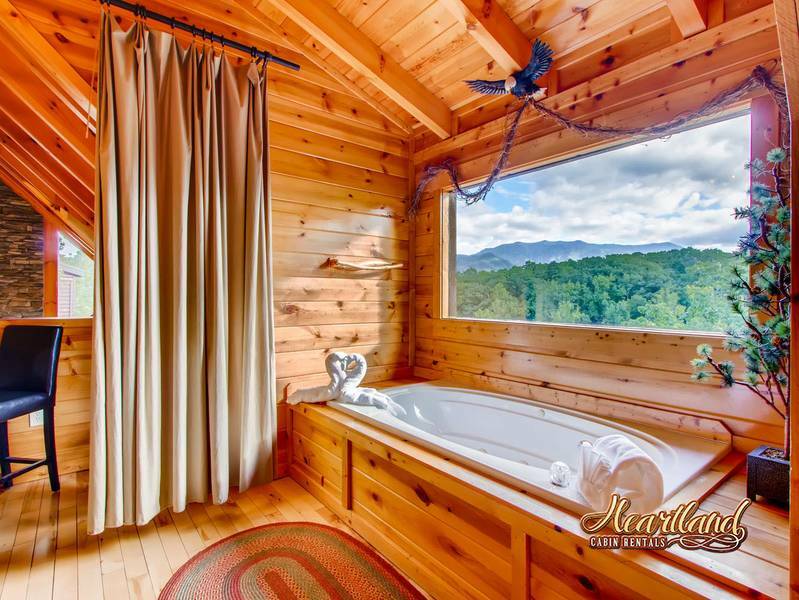 Mornings here are incredible, and my favorite place to belong (so far) has been the oversized tub with the picture window. 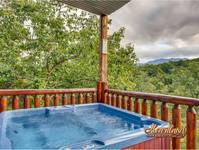 Winter here has been wonderful, and I am hoping to come back in the warmer months to enjoy the community pool and spend more time on the deck in the hot tub!